Let us help you restructure your company. Bespoke HR can help companies with the management and organisation of company restructures. The nature of small businesses means that companies can often find themselves overstaffed, or in a position where the business has changed and the current staff skill-set does not meet the needs of the business. Bespoke HR can manage the whole process from assessing the needs of the individual business through to dealing with redundancies if necessary. A small company of 35 people was suffering from the ill effects of a lack of company structure. Bespoke HR conducted an assessment of the current staffing levels and evaluation of the roles of all the employees. It became clear that several roles within the company were being duplicated and no defined company structure led to inefficient working practices. Bespoke HR worked with the management team to develop a new company structure. This was followed by the development of job descriptions including key competencies and objectives in order to measure staff performance moving forwards. 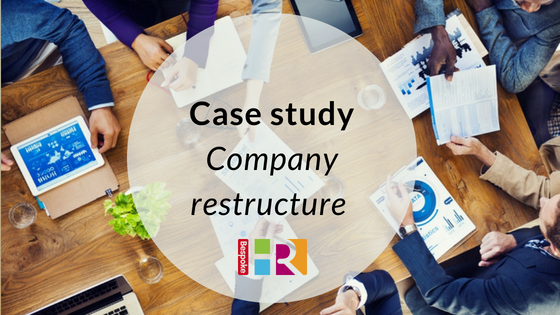 Bespoke HR communicated the company restructure to employees and fully managed the process. New roles were filled with the right candidates and necessary redundancies were handled according to employment law. The company now employees 22 people and is running more efficiently, effectively and profitably. Staff moral has improved as individuals feel the benefits of having their roles clearly defined. In addition the wage bill has decreased drastically. The company wanted this process managed over a lengthy period of time (approximately 4 months). The cost of this was in the region of £4,000; a fraction of the savings made from reducing the wage bill. Could your business use a HR healthcheck?